Lupus is characterized by pain in the joints and muscles, anaemia, swollen lymph glands, nausea and vomiting. These are only some of the most common lupus symptoms for which treatment is obligatory. As medicine for lupus has not been found, treatment is directed at alleviation of all existing inflammation and to reduce the risk of complications caused by this autoimmune illness, read more about it. Systemic lupus is a connective tissue disease that can affect various parts of the body, including the nervous system. 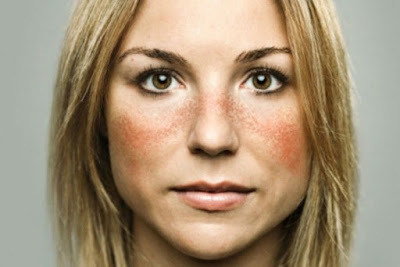 However, the vulnerable are primarily the joints, kidneys, blood and skin on which the changes most commonly are manifested as a characteristic redness on the cheeks, butterfly-shaped (hence the Latin name lupus erythematosus). As in the case of other autoimmune diseases, the exact cause of systemic lupus is not known. However, scientists point out that lupus disease is caused by the association of several external and internal factors such as inheritance, hormonal instability during puberty, some viral and bacterial infections, certain medications, overexposure to sun. Basically the generation of antibodies mistakenly attack healthy organs and tissues. While this autoimmune disease usually affects people aged between 15 and 45 years old, it can occur even in infancy. Given the fact that more frequent lupus symptoms are manifested in women than in men, (and to a whopping 9 times more often) it is believed that hormones play a major role in the development of the disease. Systemic lupus disease has a very broad symptomatology, but the first signs of disease are very discreet and cannot be determined easily. Systematic lupus symptoms are usually pain in joints and muscles, fever, fatigue, anaemia, swollen lymph glands, nausea and vomiting, headaches, stomach bloating these are just some of the earliest manifestations of this very serious disease. Initially lupus disease affects only one part of the body and later can travel to other parts of the body, hence the name systematic. Sometimes noticeable are changes in the muscles and joints in the form of pain, swelling and redness of the joints of the hands and feet, and this situation may last for months, even years, before second symptoms are manifested. The most common consequences of this disease are damage to bones and osteoporosis. The redness of the nose and cheekbones in the form of butterflies are a typical symptom of lupus. Changes can be with or without blisters, and most often occur when the skin is exposed to sunlight. Stains are pale or dark, and in the subcutaneous tissue can be nodules over which the skin is red and inflamed can occur. After a while nodules on the skin disappear, and in their place remains a small dent. One of the earliest signs of systemic lupus is hair loss (alopecia). Also occurs an inflammation of lining of the heart and, consequently, chest pain, at the same time these are the most common signs that cardiovascular system is affected. The changes are visible on the ECG, although in some cases lupus symptoms are completely absent. This less commonly leads to inflammation of the heart muscle, and tachycardia which also points to this condition. Hypertension is a common companion of systemic lupus, and also venous thrombosis. Characteristic lupus symptoms are pain while breathing that is amplified when you make a move, while the pectoral muscles are painful to the touch. In the acute stage of lupus disease can lead to pneumonia or lung tissue. Nausea, vomiting or difficulty in swallowing occurs often, as a result of either the disease itself or from effects of certain medications. Sometimes renal insufficiency occurs, it is detected by analysis of urine, and is manifested by an increase in blood pressure, the appearance of blood in the urine, swelling of the feet, legs and eyelids. Renal failure happiness less often - only in severe cases. For now there is still no cure for lupus, a therapy primarily focuses on alleviating inflammation and reducing the risk of complications. Shortly after the discovery, lupus disease is very active and requires treatment with high doses of drugs to prevent organ damage. Patients are advised psychophysical relaxation and avoiding the sun. Proper nutrition plays an important role in the prevention of, and for controlling lupus. Patients with this disease are advised moderate consumption of salt and sugar, as well as all other foods that promote inflammation, such as those of animal origin (meat, eggs, and dairy products). From diet it is necessary to eliminate the industrially produced food because it is full of trans fats. There is evidence that raw foods and fresh fruit and vegetables affect the fact that lupus symptoms retreat, and it has been shown that fish and omega-3 fatty acids reduce inflammation, and are advised to be used as often as possible, Mediterranean diet is recommended. Autoimmune disease lupus is very complicated to treat. Official medicine is based on treatments to reduce the possible consequences and complications. This method of treatment is not well accepted, and does not bring the best results, and there are many other alternative solutions. Ayurveda medicine and homeopathy have a completely different attitude about lupus, as well as in the treatment. Read about them on our page. Mix equal quantities of honey, flour, apple cider and plum brandy. Knead the dough from these ingredients, and, if necessary, add a little flour. Develop the dough in the form of cakes and put on painful joints. Put the cellophane over it and fasten with a bandage or a scarf. In the morning, throw a compress, a sore spot, rinse with lukewarm water. Repeat at least for 5 days. Peel two lemons and cut them in a cutter, and then add one scrambled egg whites and a few tablespoons of clay to produce a mixture density of cream. Mixture in a thick layer is applied to the gauze or cotton cloth and applied on the sore spot. Put cellophane over it and strengthen with bandage. Leave on overnight and in the morning rinse with lukewarm water and wrist with massage oil. Pour 1/3 teaspoon of thyme in 2 dl of boiling white wine and cook for 2-3 minutes. When it cools, use it to massage painful joints, several times a day. In the glass jar pour a litre of local red wine and 100 grams of dried nettle leaves, stir well and close, and allow it to stand for 24 hours. Strain and drink a decilitre in the morning before meals and at bedtime. Blend 100 g carrots, beets and radishes, and pour into a jar and refrigerate. Take one tablespoon three times a day before meals. Treatment for lupus disease lasts three months. Peel and grate 3 kg of beetroot and 2 kg of sour apples, then add the juice of half a kilogram of lemon and 2 kg of local honey. Stir well with a wooden or plastic spoon and kept in a sealed jar in the fridge. Three times a day, eat one tablespoon of this mixture. Mix two tablespoons of finely chopped chicory root and one tablespoon of nettle leaf, blackberry leaf and flower paintbrush and sage, and all overflow with 1.4 I of boiling water and leave covered to stand for 120 minutes. Strain and drink a cup of tea (2 dl) before and after all the main meals. Therapy lasts for 10 days. Mix one tablespoon of parsley leaf, celery leaf, leaf spices and birch, and all overflow with 7 dl of boiling water to cover to stand for 2 hours. Strain and drink 2 dl of tea three times a day, before meals. Drink for 10 days. Mix one tablespoon of nettle leaf, sage, horsetail leaf and flower and milfoil leaf, and all pour with 7 dl of boiling water and leave it covered to rest for 2 hours. Strain and drink 2 dl of tea three times a day before meals. Drink for five days. Mix 2 tablespoons of parsley leaf or root, carrots, celery root and leaves, and all pour with a litre of boiling water and leave it covered for an hour. Strain and drink during the day. Drink for 10 days. Mix one tablespoon of leaf and flower of milfoil, leaf and flower of paintbrush, aerial parts of knotweed, birch, cherry stems and leaf of parsley, and pour a litre of boiling water over it and leave it covered to stand for two hours. Strain and drink during the day. Drink for 10 days. Lupus disease reduces a large number of white blood cells and contributes significantly to the decline of immunity. Here are several recipes, which will help to raise the immune system and the creation of leukocytes. Pour 3 tablespoons of chamomile flowers with 7 dl of boiling water and leave it to stand covered for 90 minutes. Strain and sweeten with homemade honey. Drink a cup of tea before all main meals. Mix 3 tablespoons of leaf and flowers of milfoil and spoon of paintbrush flowers and all overflow with 7 dl of boiling water and leave it covered to rest for 90 minutes. Strain and drink a cup (2 dl) before all main meals. Mix 2 tablespoons of sage, chamomile flowers, and juniper berries, and all pour with 1.41 of boiling water and leave it covered for 90 minutes. Strain and drink 2 dl before and after the main meals. Until recently, the lupus disease was considered almost one hundred percent fatal, but after a few years, today it is no longer considered like that. Since 50s of the last century onwards, things have drastically changed for the better and the prognosis is much more optimistic. With medium-severe forms of chronic systemic diseases, recorded were spontaneous withdrawals, of course disease can be well controlled when in remission, especially if detected early. In case that the systemic lupus suddenly caught kidneys, lungs (especially bleeding), central nervous system or other secondary infections, then the prognosis is not so good, and usually ends with a fatal outcome. With the newest analysis it was found that 90 percent of patients with lupus, today on average live around 10 years. It is important to know that lupus disease can spontaneously withdraw, but it is extremely important that it should not be neglected or forgotten about, because it can always re-occur.